In Shrikrishna Kashyap: A Master – On the Liberating Power of Dignity, writer Dr. Patricia Brown (Gayatri) has compiled, in photos and a collection of his teachings, a memoir of this East Indian holy sage and doctor who imparted awe-inspiring wisdom throughout the world. Dr. Shyam, a healer of body, mind, and spirit, is known and appreciated for his life-changing, wisdom-replete interventions. Brown offers a thorough look at this wise and special spirit. She shares messages he repeated over time, discusses his origins in India and his creation in the United States of Wisdom Wave, a foundation for universal philosophy. The book includes his philosophical thoughts on the universe, how he fostered individual and collective self-respect, strengthened the human constitution with Ayurvedic teachings, outlined the basic trinity of conduct, enhanced genuine human relationships and more. 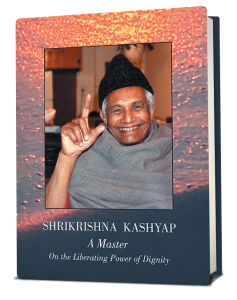 Culled from his quotations and texts and from his talks, videos, and audios of his teachings throughout thirty-three years, Shrikrishna Kashyap: A Master offers a collection of wise spiritual teachings of a man who worked tirelessly to guide others on a path of dignity, self-awareness, and emancipation. To order a copy of the book, visit our store. One of the few Ayurvedic physicians in the United States, Shrikrishna Kashyap or Dr. Shyam, as he is known, began his training in this ancient science of Indian medicine at the age of eight. Growing up in the Bombay area, Dr. Shyam met personally with such saints as Ramana Maharshi and Sri Aurobindo. Shyam was present as a young child when his father was visited by Mahatma Gandhi and began practicing yoga in childhood with “great saints, “himself tending Swami Nityananda before his death. He received degrees In Ayurvedic science and homeopathy while in India as well as a master’s in psychology and a doctorate in Divinity. Leaving his secular work for a time, he spent twelve years in the Himalayas, mastering to the highest degree the art of yoga. He wrote, The Shoreless Ocean, a philosophical treatise to be republished in the United States, directly following this profound period of self realization. Testimonials of major cures and positive changes are abundant among those who have met, received treatment and cure in various aspects of health, or who have attended Dr. Shyam’s brilliant and original talks. Shyam is President and creator of Wisdom Wave, a non-profit foundation, which caters to the spiritual and health needs of all people.